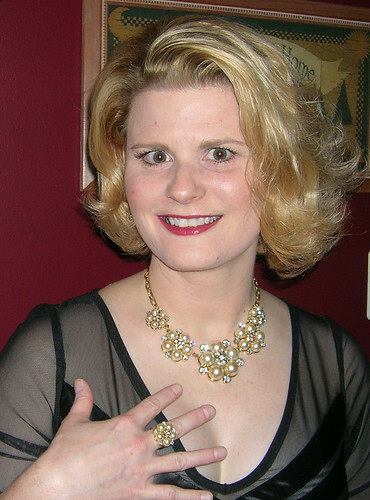 What do you all think about my bling? 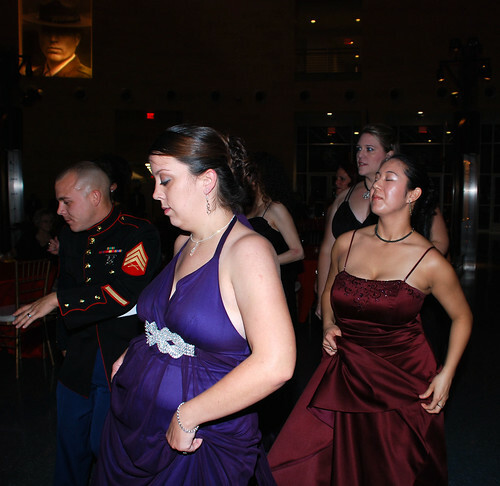 Let me start off by saying this was the most fun I have ever had at a Marine Corps Ball. I think the reason is because in the past, I have been just a date. I've not been part of the community. While I think all the wives I've met at events have been very nice, there is a huge difference between being involved in the community day-in and day-out. 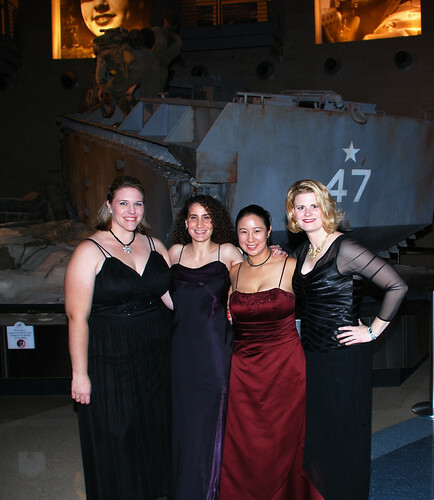 The wives in a unit have, for the most part, all developed relationships with each other over the years, through moves and deployments. A guest, which I have always been, hasn't developed those relationships. So - - when my dates aren't interested in dancing, I couldn't just go out and dance with a group of women I don't know. ( I did try it once - - only to have them look at me like I was a weirdo and close me out of their circle. 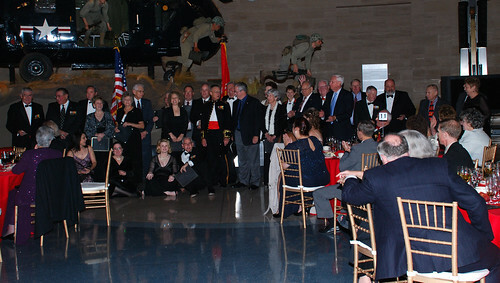 I'm part of this community that has grown at the National Museum of the Marine Corps and it is a wonderful community. Below, this would be the cake detail. They did an amazing job! They were locked in. Oh, I have to introduce you to my beautiful friends. I couldn't have asked for a better group of people to have come with me. They are so much fun. So many people were coming up to me telling me how fun my friends were. They have been such a blessing. 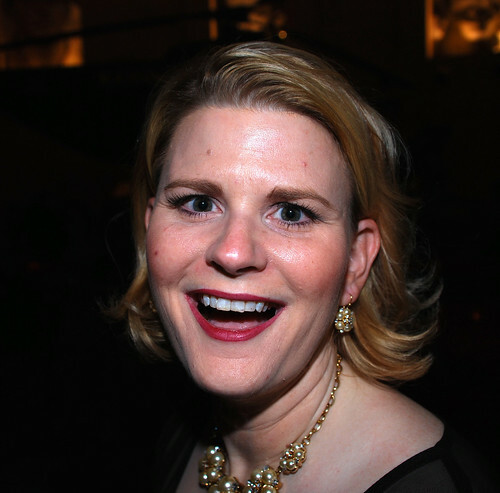 One of my friends came up to take my camera when they called my name for an award. 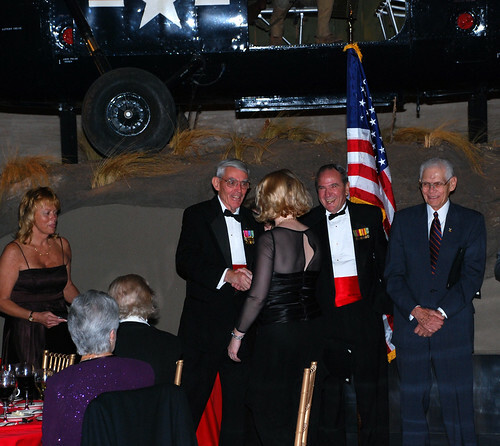 So, this is me shaking hands with our Colonel (ret). I received a certificate for having volunteered over 500 hours (cumulative) since the opening of the museum. 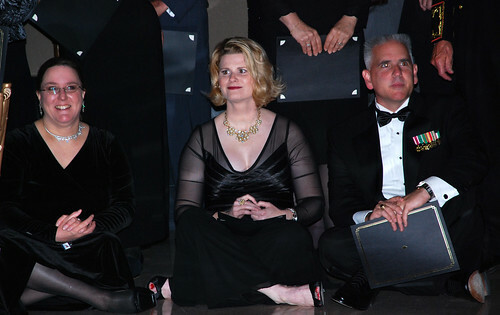 There were quite a few of us who have reached this milestone (most of us from that first class of docents) that there wasn't room for all of us to stand, so a few of us sat down in front. I had to laugh when I saw this picture. I just reminded me of something from when I was in pre-school at a holiday show. You know, they shot where you are dressed in the best clothes you have and are sitting on the floor cross legged. Here is the whole gang with over 500 volunteer hours. Now, there are a select few that have hit the 1000 plus hours volunteered. 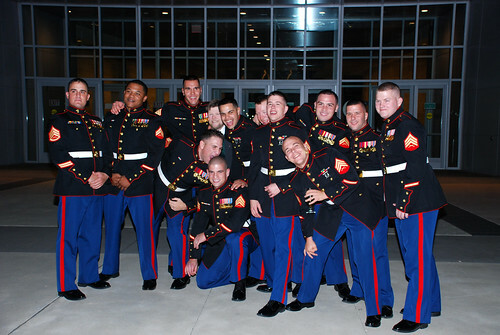 The fine gentlemen pictured below are those few and the proud. Now you might be thinking - - 1000 hours in two years, no biggy there. Well, a normal work year in the United States is 2080 hours. 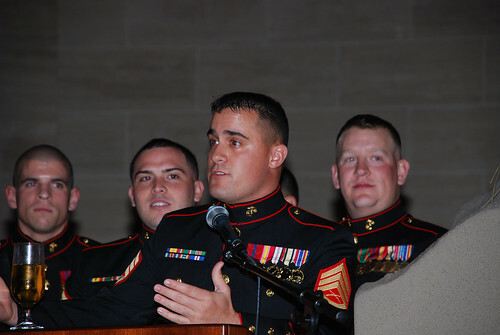 After the presentation of the volunteer awards, the Marine Detachment asked to say a few words. Here they are being introduced. Their Sergeant got up and spoke. I wish I could have taken a good picture of all the docents standing giving them a standing ovation (it didn't turn out). I think I can safely say we so enjoy having these men around. 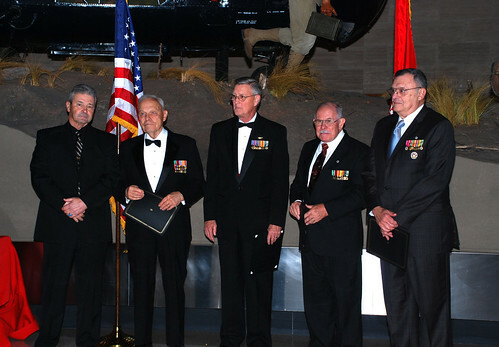 All of them have combat duty under their belts, they are the bridge for guests between Marine Corps history and the current Marine Corps. 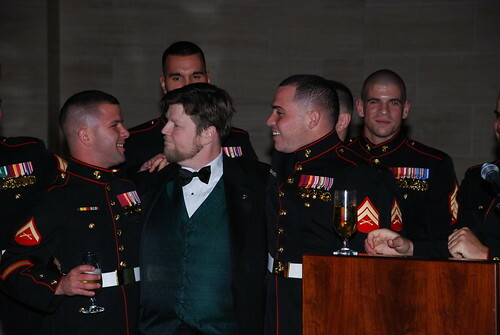 For some guests, these men, are the first Marines they have ever met up close and personal. 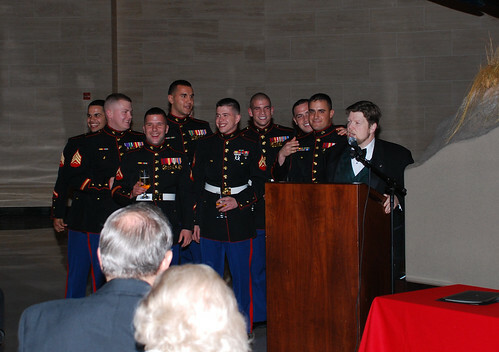 They called our Manger of Customer Service back up to thank him for all he has done for them with integrating them with our docent community, teaching them even more about Marine Corps history, and making them an active and integral part of the Museum. I really like this picture. You can tell they really like our Manager. 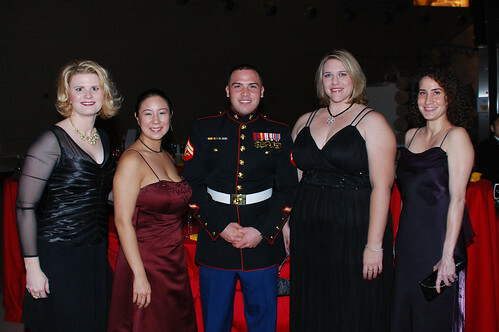 Now my friends and I couldn't come to a Marine Corps Ball without having our picture taken with a Marine. Who is the arm candy here? 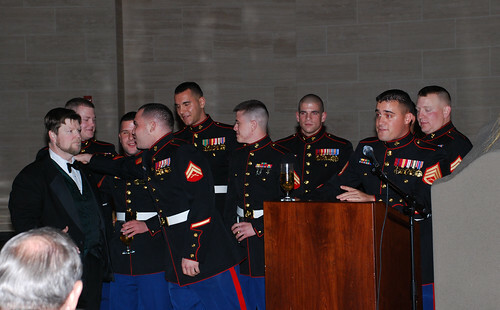 Here, my friends listen to the stories of two Marines. Yes we had dancing! And the DJ did a great mix of music. He played a lot of stuff from the late 80s and 90s. So much fun to dance to! I need to learn to line dance. One thing we were all talking about today, was that when the dancing started everyone blended right in. 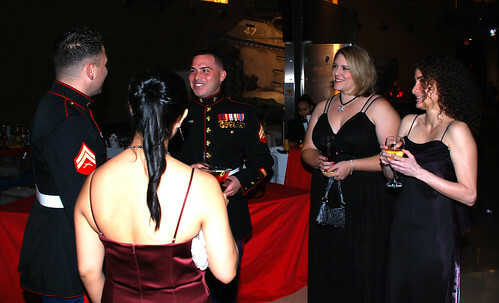 It wasn't just small groups of Marines, staff and docents -- - everyone was all about having fun together. 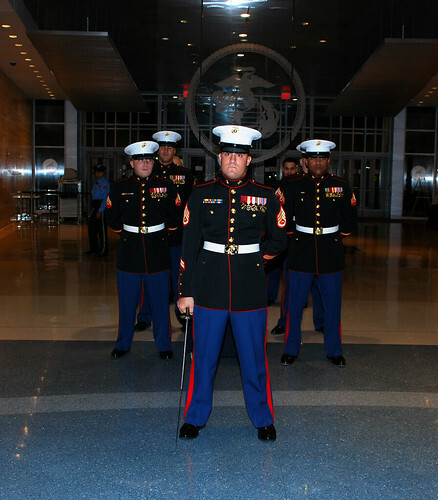 I'll end my blog with a photo of the Museum's Marine Detachment. Such a fun, good, group of guys. I'm so glad that you had a great time. Thank-you for sharing those wonderful pic's. If you ever came to MY husband's unit as a girlfriend, you would be welcome to hang with us.